Oh you guys. I have read and re-read all your comments on my previous post so many times. I've responded to so many of you directly in the comments, but I'm not sure if you get notified by email when I do that. Anyway, we have a precious little community of encouragement here. My hope and goal is that in a world filled with chaos, tragedy, heartache and questions with out answers, we could always lift one another up here on this little blog. I have said it before, but I know that not everyone who reads my blog believes in Jesus the way I do- and I want to remind you that you are so welcome here, no matter your beliefs. Jesus is my rock and my personal foundation so I'll always attack a problem from that angle. I couldn't do it without Him and that's the truth. I hope you are able to leave here ultimately refreshed by what you find. We all struggle sometimes and long to make lemonade out of those lemons. That's pretty universal, isn't it? I love that some of the women who have gone before left lots of stories and shared how they did things, or how they wished they would have done it differently, and how things tended to always work out. I love how Mamas in the thick of it left comments relating to my frustrations... and I love that some who aren't Mamas related the subject to life in general. If I could give you all a group hug, I would. Ava, however, firmly made sure I knew that she DID care about having fun napkins, flowers, cute straws, etc, and I'm pretty sure that cemented the fact that she is indeed, my child. It matters. 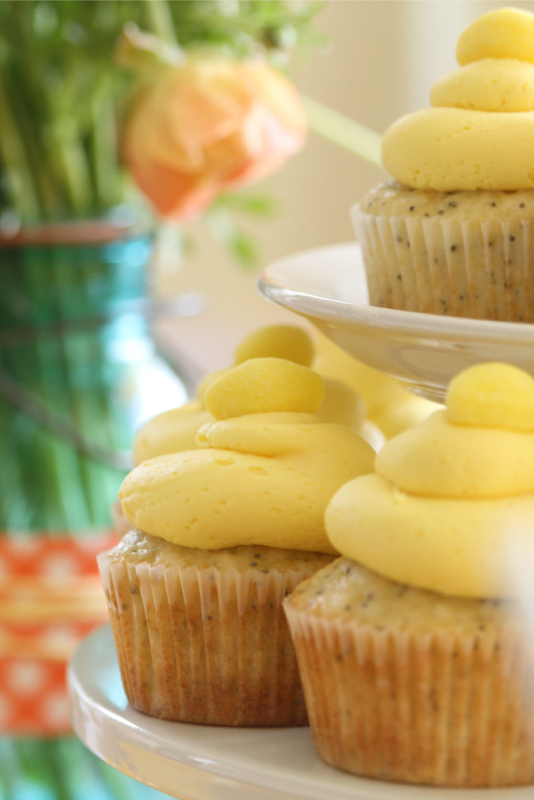 She chose lemon poppy seed cupcakes with lemon-y frosting. Cupcake recipe here fluffy cake frosting recipe here. (I added 1 1/2 tsp real lemon extract to the frosting recipe, and some yellow food coloring.) I don't know why or where she came up with that, but her wish is my command for birthdays so that's what I made. I think she likes to be unique. Anyway, I went to Marshall's to find my wrapping paper because they have the best variety and the best prices. I scored an orange and white gingham and a blue and white houndstooth design. I nabbed some softly tinted Ranuculus from Trader Joe's and placed them into a blue jar I had on hand because Ava really wanted flowers. I used some yellow yarn to pull everything together and I was finished. Easy and sweet. My favorite. My man is working a bunch over the weekend so we'll be rescuing him from work on Saturday night and going to see a great concert (Chris Tomlin and Kari Jobe) as his birthday gift. The kids are so excited. They have never been to a concert before! It's going to be an awesome time of family togetherness and FUN. I want to laugh because I tend to go into things like this with the gritted-teeth attitude of, "Alright people, we are going to have fun if it kills us!" After reading all of your comments, I am going to choose to find joy in the little things on that adventure and I'm going to keep the idea that they are really only going to remember the FUN parts, tucked inside the corner of my heart. I sure love you guys. I hope you all know that! Yes, party it up! You sure do a party right! I love your selections, and those stunning cupcakes! Now what's this about Indian food?? I haven't had Indian food for many years. I used to go with friends to providence, RI for Indian food all the time....pre-marriage, pre-kids. please share some recipes if you have a chance! I want this party! My mom used to do a theme party for us loved it each year this takes back. You really are incredible. I know that these are snapshots of your days and life and that there is so much more on the other side of the camera. I know that it's not all fun and games and sometimes the pressure that you (we) put on yourself (ourselves) is sometimes too much to bare and the darkness of it blocks out all of the radiant light that is truly present. I hope you know that (and I think you do) you have a family that loves you unconditionally and a community of friends and believers who truly think the world of you! I am sure that I am not the only one who leaves your "home" feeling refreshed, inspired and energized!! I am sure that I am not the only one who lifts you up to Sweet Jesus and asks Him to abundantly bless you and encourage you!! I know that I am not the only one who secretly (and not so secretly) wishes that we lived next door or at least a block away so that we could be very best friends and sit at your table and encourage you in person. The decor is fabulous, as always. What an amazing mom you are. So glad to hear that you don't discriminate against those who don't believe as you do. Some folks are not so open. I know the feelings you speak of. I have two adopted daughters (FASD) and her sister (ADHD). Sometimes when she's having a fit or tantrum and has a hard time, it's hard for me to look at the fun aspect of things we are doing/experiencing. I too, am trying to remind myself that it is the memories for them that we are making and that I need to look at it from a fun perspective and not stress myself out about what it should be, versus what it is (in my case, cause I admit I do that sometimes). I am looking at it through their eyes and the memories they will have of growing up. I get bogged down in the fits/tantrums of my special needs daughter and I need to stop doing that. Hope your loved ones have a good birthday and thanks for sharing that very real part of your life with us. I literally LOVE how you celebrate/decorate for parties in your house. You spare no detail....LOVE all of it. I personally think you should give us a tutorial on cupcake decorating. HINT HINT. I'd give anything to be at that concert with y'all...Kari Jobe is my favorite. Good Gracious! Will you come decorate for MY birthday? What a gorgeous color pallette!!! You had me at the first picture! Oh Sasha, these are so beautiful. I was captured by the first photo too. I'm sick, I've been sick for a couple of days & in bed b/c I am so light headed & all. Your blog is the one to brighten up my day with your beautiful photography. This really tickles me, so fun! Love you & yours & are always in my prayers girly. You're right about the lemons & lemonade. His graces are what keeps things going. You know, as a matter of fact, today I asked my munchkin if he knew what grace was,... " Grace is God in action". Love that kid. A Happy Birthday to Ava & Adrian! I am somewhat new to your blog and this is the first time writing to you. I love what you do for your birthdays and I am going to remember this idea for my sweet daughters bday in June. I love the little milk bottles you are using and was wondering where you find them. I absolutely love them and I know my guys would love them also. Will you be posting the receipe for the cupcakes as they look so good. Oh, your sweet spirit just shines through like the rays of the sun. What precious party decor, it can't help but be fun! Blessings to you as you "go forth and have fun." i so want to come party!!! and that ava - she's a little foodie! lemon poppyseed?! pretty sure most 10 year olds don't even know of such a thing. that is so cute!! your pictures are gorgeous. i love you and your heart. you shine for HIM! Have a fun party! Everything looks great! Those cupcakes look so yummy, too! Lovely! I am gearing up for a Confirmation party on Friday for our son and our daughter turns 16 on Sunday. Party central around here as well. Enjoy! You sound happy and that's good. I so want to come to your party, you have decorated beautifully. I love the little bottles and straws and the jar in which you popped the ranunculus and your cakes... a big Happy Birthday to Ava and Adrain. Have lots of FUN!!! Those cupcakes look delish... and those flowers are so pretty! Everything looks so pretty. I have a question about Ranunculus. I just bought some from TJ and I am wondering will the buds open. As much I love them I'm wondering about there care ......HELP !!!!!!! Sasha...I hv loved your blog since I found u!! we saw Chris Tomlin in tri cities night after you guys in Seattle! LOVE! wish we'd taken kiddos!! so I'm wondering about your cool cabinet that the rooster sits upon... what do u store in it?? I'm glad you've posted. pic of it. I have a dresser with similar handles and I thought I'd hv to significantly change them out. now that ive seen yours I cn envision it looking great with just a fresh coat of white paint!! Those cupcakes look really good.